The last part of the trip was emphatically more fun. When we got back to the city, we had a drink at the Hard Rock Café in the Square just to say we’d been there – and it was Mink’s first experience at an HRC (and they’re all similar, those lovely chain bars). 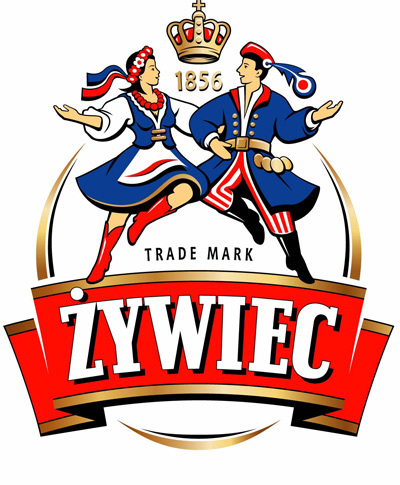 We drank the local beer, Żywiec, and learned that the Polish word for beer is piwo. I asked the bartender how to pronounce the name of this particular beer, but was incredibly unsuccessful at replicating the sounds coming out of his mouth. Polish is a crazy language! The beer makes them dance with joy! Mink and I chilled to the random performance occurring in the bar by a crazy, piratesque man with tattooed sideburns (for real!) 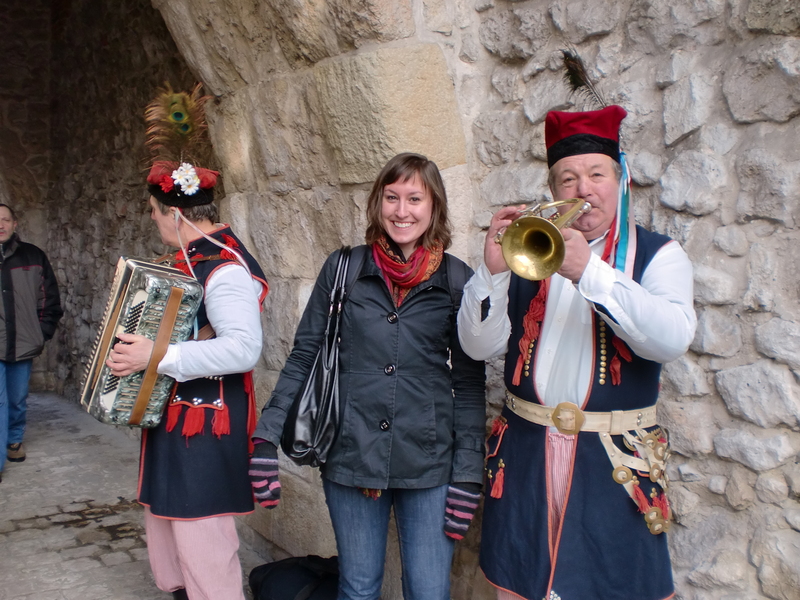 playing the bongos for a while, and then decided that we should move on in search of adventure. 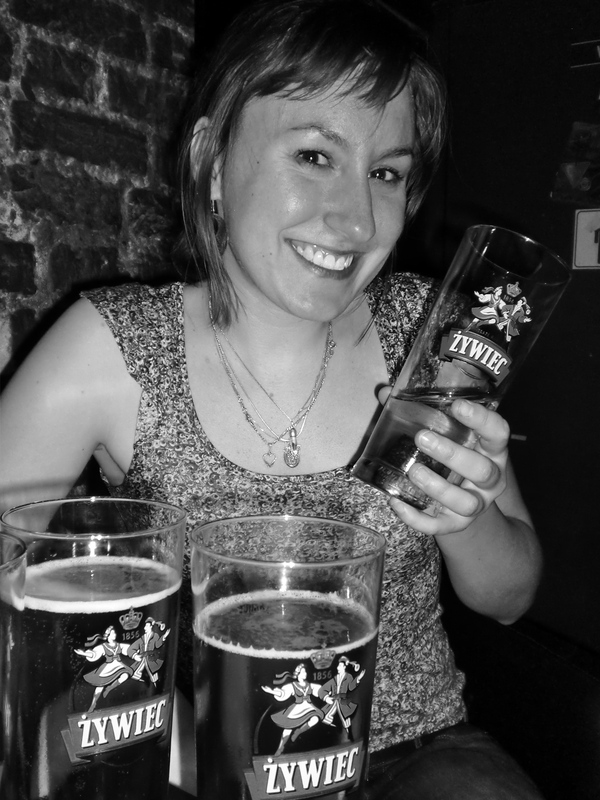 We made our way to Irish Mbassy, which was apparently voted one of the best pubs in Kraków, to find food and alcohol. On our way there, our timing was such that we heard the trumpet man playing a hymn called the Hejnal out of the windows in the tower in St. Mary’s Basilica. According to the legend, Poland was being invaded in 1241 and the bugler in the tower sounded the alarm about the approaching warriors. His warning was early enough that they closed the gates in time, but he was shot in the throat before he could finish the hymn. 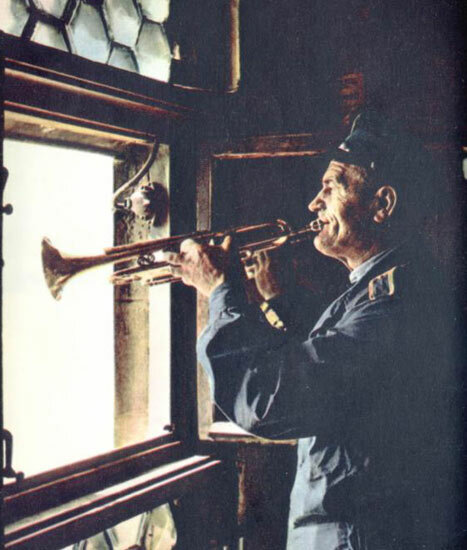 That’s why, when the trumpet guy plays the hejnal now, every hour on the hour, it stops abruptly at that moment. Just doin' my job, please don't shoot me. And oh, did we ever sing. People are generally reluctant to participate in public displays of humiliation (the true definition of karaoke) until they have a few beers in them. At this point, Mink and I were in the perfect mood to let loose and sing some ’90s hits – we had just spent the day at Auschwitz, the worst place ever, and we were in a strange town with a bunch of strange people (including a Scottish bachelor party, all overweight men wearing tams with fake orange hair, no less!). We won the crowd over by singing Tiffany’s “I Think We’re Alone Now,” and there was no stopping us after that. Rest assured, it was the first of many performances. Oh this? I'm just watching this beer for a friend, I swear. Mink even got a bachelor tam/orange hair combo as a souvenir. We met two affable middle-aged Irish guys, and we decided to find another bar with them when the Mbassy closed around 2 a.m. As it was sleeting outside, we hitched a ride on a bike-rickshaw. It was epic that this man could pedal his bike at all, what with all 4 of us piled haphazardly onto the front cart like that. We told him to take us to another Irish pub and we ended up at a place that was literally called “Irish Pub.” I’ve gotta hand it to the guy for being so tenacious in his pedaling and accurate in finding our desired destination! We stayed to play a game of pool, but we were soon not-so-politely asked to vacate Irish Pub. It was clear that we had to find a more intense Polish secret-club that was open all night. We discovered one of those hole-in-the-wall places called Lubu Dubu, which opened into a multiroom party where the piwo was still flowing and the Polish hipsters were dancing the night away. Lubu Dubu was my favourite bar in Kraków for the atmosphere, but Irish Mbassy was a close second. We crashed at the hostel at 5:30 am, although apparently it’s easy to stay out until 8 or 9 a.m. in this city. The mix of emotional and physical exhaustion of the day before called for a bit of relaxation. I woke up around noon and went wandering by myself for a while, since it was cold but sunny and beautiful out. I ate a street pretzel whilst fending off the eternally perseverant pigeons, and then had a cappuccino and did some writing in a cute place called Café Botanica. Upon returning to the hostel, I met a guy from Paris named Florian who was asking about where we were heading that night. We went for a beer at a random bar that was up a staircase that I never would have found on my own — it was another one of those places that you don’t know how to get to unless you’re already there, like every cool place in Kraków. The bar had awesome ’70s décor and a very chill atmosphere, perfect for an afternoon beer. Florian and I swapped stories about concerts and traveling and discussed what cities I should see next, since it’s so cheap to fly in Europe. I told him that Iceland is up there on my list because of my love of Sigur Rós, but I have no clue when I’m going to be able to afford to swing by Reykjavík for a visit. Someday. Mink and I went for dinner at an Italian place and finally tried the bison grass vodka (called Żubrówka, pronounced zoo-brewf-ka) with apple juice, which is apparently a Polish thing and tastes like apple pie. Very delicious. We returned to the hostel and went to an underground cave-bar with Florian and his married friends. My attempt at speaking French with them was pretty rusty because I’ve been hearing a lot of German for the past few months, but it was nice to mostly understand a language for a change. Next, we went to a club called Diva which, despite its lame name, turned out to be fun. The girls on the dance floor were crazy though! They were uniformly huge, drunk and salsa dancing like no one else was within a five meter radius (which was clearly not accurate). We sustained minor damage to the kidneys from random elbow jabs, and Mink still has a wicked bruise on her leg from a girl’s deadly stiletto finding its mark, but otherwise we emerged into the chill of early morning, having said goodbye to our French friends, mostly unscathed. 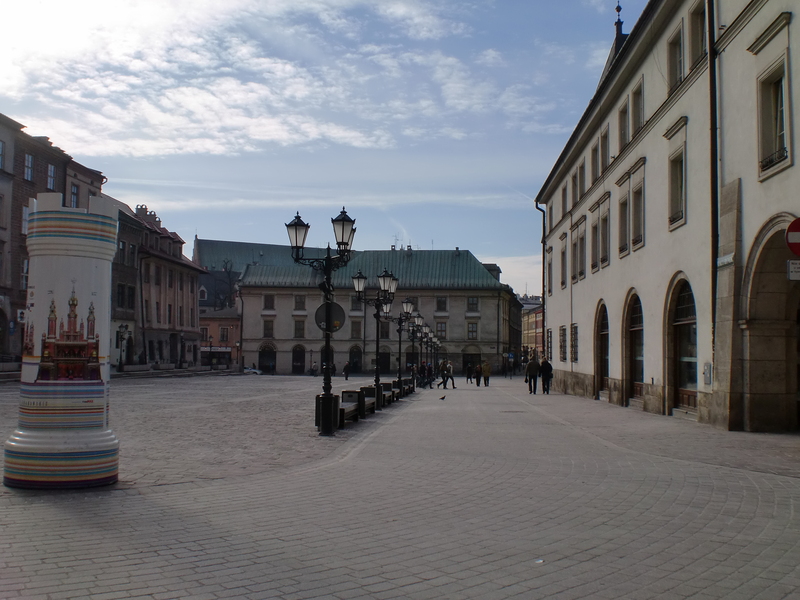 With only a few hours left in Kraków, we packed up and checked out of the hostel around 9:30 a.m. and wandered around the square one last time. 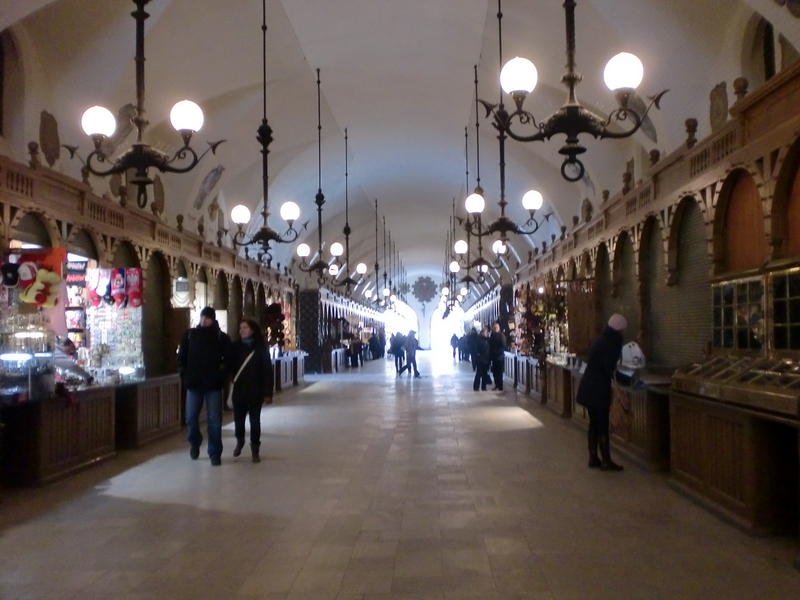 We bought some souvenirs at the Cloth Hall, including a babushka scarf that is really pretty and a sweet canvas bag with a dragon on it, and took some more photos. 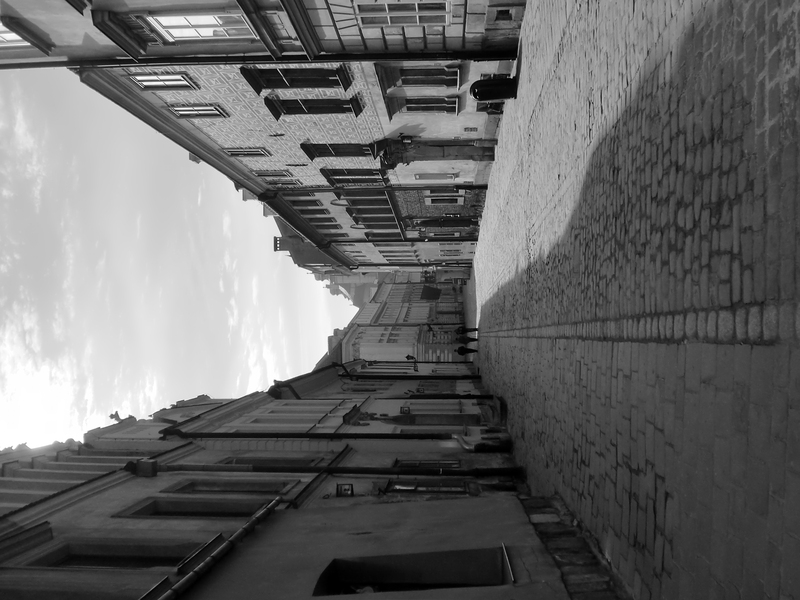 We purchased some different kinds of vodka for our friends back home, as promised, and saw the quaint, cobble-stoned street where John Paul II lived pre-popedom, Kanonicza Street. We made our way to the train station in plenty of time, but the platforms frustratingly didn’t have the information on them so we caught our train with only a few minutes to spare – it would have been rather awkward to be trapped in Poland, so we got lucky in that. The train ride home was uneventful but beautiful… the highlight was seeing some kids doing graffiti by the tracks a little ways outside of the city. Our train arrived in Vienna at 20:30 and we got back to our apartment tired but satisfied – with no muggings or missed trains or lost luggage! When I was working at the bar on Monday night I met a girl who is from Poland, and she confided that Kraków is the most beautiful city, she is from a hideous city (called some name that sounded like it only had consonants), and that I shouldn’t feel the need to go back to that country unless it’s to see Kraków in the spring. I give her props for honesty! So, thanks for all the love, Kraków – maybe I’ll be back someday when it’s a little warmer. Your stories are making me soooo jealous! Sounds like you are having so many fun experiences. Miss you!!! thanks Chels! I am having an awesome time… i miss you too!